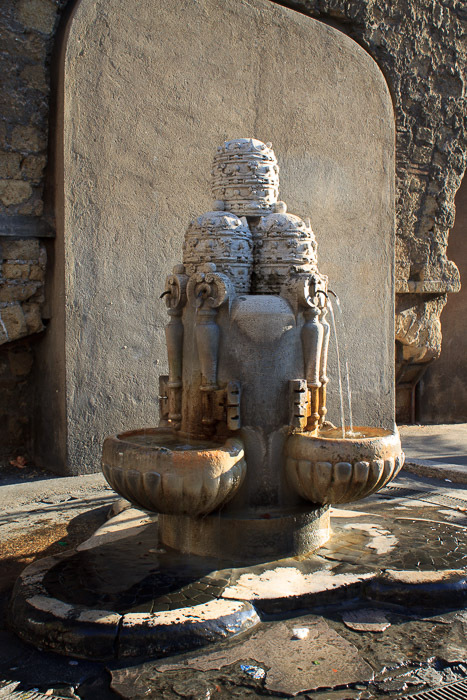 Built in 1927 by Pietro Lombardi to express the history of the Borgo district, the Fountain of the Tiaras is a small travertine fountain with 6 streams of water flowing into 3 semicircular shell-shaped bowls, two flows for each bowl. The water flows from keys of Saint Peter mounted on three papal Tiaras at the top of the fountain. The arms of Rome and of the district Borgo are carved into the spaces between the keys. Pietro Lombardi was commissioned by the city to build 9 other fountains representing other districts, including the Fontana dei Monti and the Fountain of the Pine Cone. See all Fountain of the Tiaras photos.